Welcome to Cabins at the Crossing, the perfect escape from your everyday life. Located in Eastern Tennessee these cabins are isolated from society to let you enjoy the serenity of nature but also just a stone’s throw away from all the main attractions of Pigeon Forge. 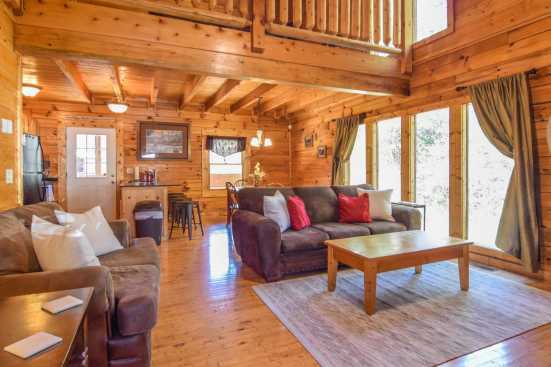 The vacation rental cabins come in a variety of sizes from quaint two-bedroom cabins to large seven-bedroom cabins to accommodate groups of all sizes. All cabins include access to the community pool as well as hot tubs for each cabin to enjoy. Our kitchens are fully equipped just in case you want to stay in and cook a gourmet meal while you take in the nature from the comfort of your cabin. As you venture away from the cabin you will realize that there is so much to do just a short distance away. The famous Dollywood Theme park is just up the road and sure to entertain the whole family. If nature adventures are more your style, there are hiking trails all around your cabins as well as the famous Smoky Mountains National Park just up the street. When you’re ready to settle down for the evening you can’t go wrong stopping into Applewood Farm restaurant and grabbing some southern comfort food along with their world-famous apple fritters. SmokyMountainsByOwners.com is your online destination for all your Eastern Tennessee vacation planning. Our goal is to accommodate all your vacations needs from booking a property to helping you find the right attractions for you and your group.